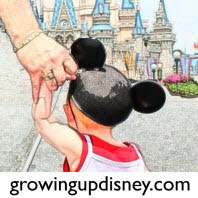 Growing Up Disney: We're almost ONE! Growing Up Disney will soon be one. What started as a desire to share what I had learned while visiting with my daughter has grown into a wonderful experience! I've met some amazing people and have loved sharing my family's stories and yours. Be sure to check the blog during April for our celebration. I'll be thanking those who have contributed to the site over the past year, both bloggers and giveaway sponsors. And don't forget, a birthday needs presents and these will be for you! Ridge picked up a couple of surprises on his recent WDW trip and Kelly at Travel with the Magic is sending even more Disney goodies. Let me know if you'd like to give a gift to our readers. Thanks to all who have been a part of this journey, both readers and writers! Let's celebrate! Alden, so glad you've joined us! And I see nothing wrong with planning well in advance. I think planning is a big part of the fun (for the planner anyway.) Can't wait to hear about your trip!